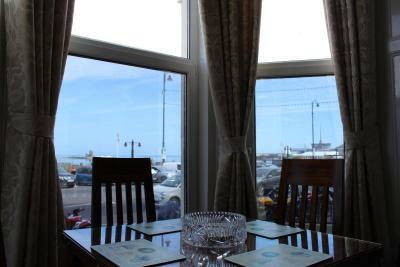 Lock in a great price for The Town House – rated 9.4 by recent guests! The location was wonderful! The bus stop to the airport is right across the street and the main bus stop is 5 to 10 minute walk away. You can take the horse trolley right outside of the hotel (just flag it down) to the Electric Railway and the Douglas Steam Railway is also a short walk away. There are plenty of bars and restaurants within walking distance as well. The kitchens are well appointed. The rooms were large, clean and comfortable. The windows did a good job keeping the outside noise down but if you don’t have a seaside view, don’t expect a view at all. The manager made a special trip to the store to get me yogurt and fruit versus the normal cereal and milk. 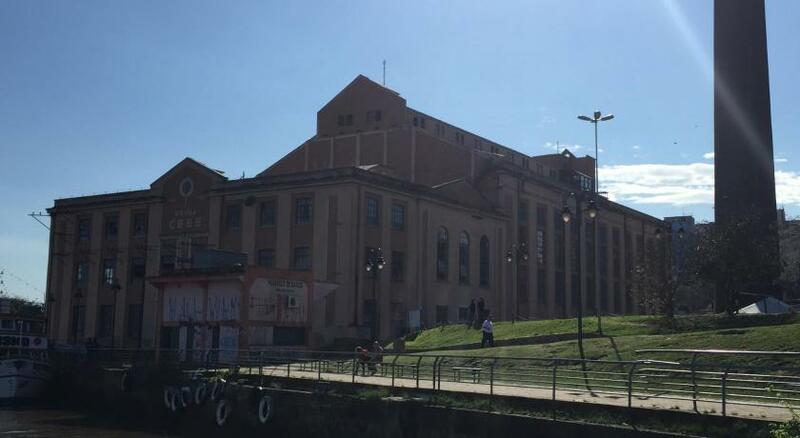 The hotel could use some upgrades but in general, it is in good condition. The staff is helpful and friendly for the most part but you have to initiate the conversation and ask for help otherwise you will probably find yourself on your own. 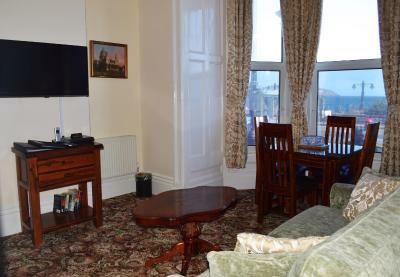 Nice well looked after apartments in a great location in Douglas. Helpful staff and clean rooms. I liked the fact that we had our own kitchen and basic breakfast requisites were topped up daily. I liked its central location and the helpfulness of the staff. I found the airport transfers organised by the hotel was an excellent service.Would definitely book again. Lovely apartment. Very spacious. Shopping just behind property. 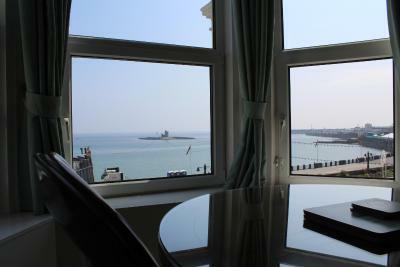 Beautiful room, amazing sea views. Lovely hot water. Hot chocolate provided when requested, not single sachets either, big container! Bread, milk, cakes supplied. Friendly staff, exceeded expectations and will return for sure. The ambiance was lovely. Lovely and peaceful and quiet, decor was devine, easy to check in and check out. Very friendly and helpful staff. Room immaculate, everything you need to assist you(ironing board,dishwasher,etc.We were able to leave our luggage on the day of our departure at the Town House until we needed to get the ferry home,this was a real help to us as our ferry didn't leave until late afternoon.Would definitely stay there again. The Town House This rating is a reflection of how the property compares to the industry standard when it comes to price, facilities and services available. It's based on a self-evaluation by the property. Use this rating to help choose your stay! 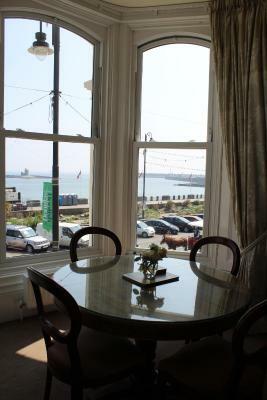 Boasting breathtaking views over the harbor, this luxury apart-hotel is ideally located on the promenade in the commercial area of Douglas, on the picturesque Isle of Man. A luxuriously restored Victorian town house, the hotel features 15 unique suites, enabling you to enjoy the freedom of your own space, while benefiting from hotel services. Each suite features a double bed, one sofa-bed and a fully-equipped kitchen. If you would prefer not to cook for yourself, you can choose to eat in the Coast restaurant, or venture into the heart of Douglas to sample the local eateries. This property also has one of the top-rated locations in Douglas! Guests are happier about it compared to other properties in the area. This property is also rated for the best value in Douglas! Guests are getting more for their money when compared to other properties in this city. 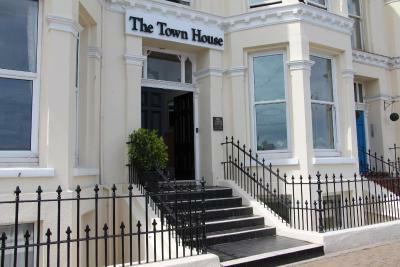 When would you like to stay at The Town House? At the back of the hotel, this suite consists of an open-plan sleeping and living area, a separate kitchen and bathroom. 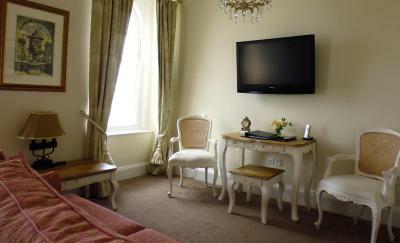 Free Wi-Fi, a 40'' flat-screen TV and a double sofa are standard in all rooms. A welcome pack including basic breakfast items is included in the the room rate. Located at the back of the hotel on the third floor, this suite has a separate bedroom with an private bathroom. It also features a full kitchen. Spread over 3 floors of the hotel, these apart-suites feature large living rooms with sea views and 40'-inch flat-screen TVs. 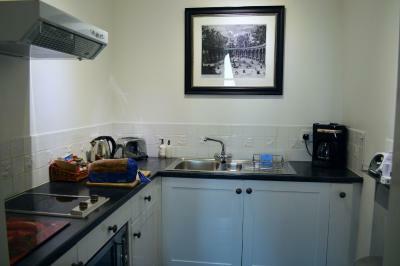 Each includes a fully equipped kitchen, free Wi-Fi and a double sofa bed in the living room. This two-bedroom apartment has sea views. The main bedroom has 1 super-king-size bed and the second bedroom has 2 twin beds. 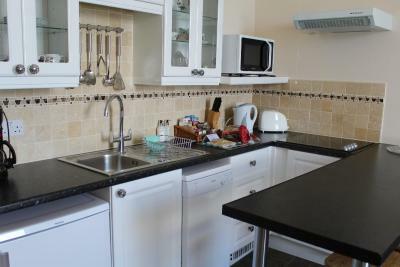 There is cable TV and free WiFi access, as well as a Kitchenette and large living room. We are a unique property in the island which offers full hotel service but your hotel room is an apartment. There is no need to sit in your bedroom to relax, sit in the lounge or around the kitchen table. 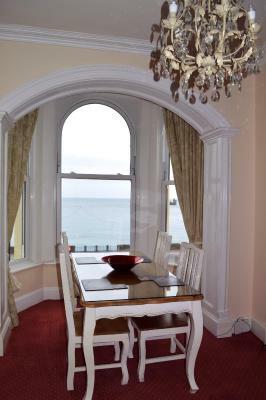 Just 5 minutes walk from the sea terminal we are right at the heart of Douglas town and business sector. House Rules The Town House takes special requests – add in the next step! The Town House accepts these cards and reserves the right to temporarily hold an amount prior to arrival. If you intend to arrive out of normal business hours (08:00-17:00) please confirm your arrival time with The Town House so they can make sure the duty manager can meet you. If booking on the day of arrival, please call to confirm your booking. 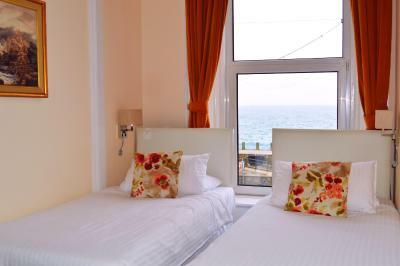 For reservations of more than 3 nights or more than 2 rooms, The Town House will charge a deposit. The apartment was immaculate and absolutely fantastic with everything we could possibly have wanted. Beautiful sea view to wake up to every morning. No bath in our room ,only shower. Nothing wrong with that only like to have bath for the kids. Cleanliness, room decor, well equipped. 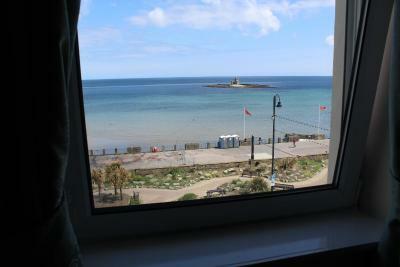 We didn't like the view,this was are own fault -we didn't book early enough for a sea view. Bedside lamp didn’t work. Although it was fixed promptly after mentioning it. Bed very comfy. Liked the fresh baked cake and biscuit left in kitchen each day. The location was fantastic, the apartment was well serviced, loved the little extras!! !- home.made treats !!!! The manager called me immediately after my booking to let me know I would have to move on the 2nd night of my 3 night stay. While I was okay with it at first, it found to be inconvenient when I checked out of my room at 0930 and told my new room would be ready in about 90 minutes. I came back at noon and it was still not ready. I had to wait another 30 minutes which messed up my agenda for the rest of the day. I am not an expert at hotel management but I could not understand why I was moved as the room I was moved to was almost identical only it was on the ground floor with an even worse view of what I had before (as if that were possible), right underneath a family with small children that ran around almost the entire day, night and morning. This might have been an isolated incident but for me it put a bad taste in my mouth. I also don’t know what the other rates are for accommodations in the area, but 125 quid a night seemed a little steep to me but then again it’s all about location.